This is an 1880 map of Henderson, Kentucky, from D. J. Lake & Co. 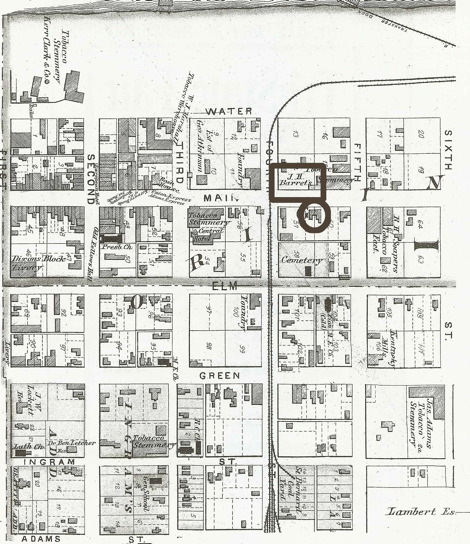 The map conspicuously shows a railroad running up Fourth Street that was not present during the Civil War. Other than that, the map is a close proximity to the town layout during the war. The marked rectangle is the location from where Adam Johnson and his "band-of-three" attacked the Union garrison on the evening of June 29, 1862. The marked circle is where the Union garrison was headquartered that evening. You can still walk Main Street in Henderson today and get a feel for how the attack was executed. The large blank area at the top of the map is the river bank slope leading to the Ohio River . From the Illustrated Atlas of Henderson County from D. J. Lake & Co. (Philadelphia), 1880.